This is a 2-day 4×4 route that takes you through the Messum Crater, along the western side of the Brandberg and down the Ugab Valley into the Ugab River. The lunar landscape of the Ugab Valley is breathtaking. Its made up of mica schist ridges that are compressed and folded and look like they are lying on its sides. 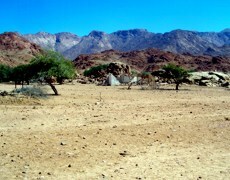 This is rock desert, typical of Damaraland, and the rock formations are most unusual. Make sure that your tyre pressure is not too hard and that you take enough spare tyres with you. It is fairly common to encounter desert elephant in the Ugab River as they move along the riverbeds where they find their food and water. 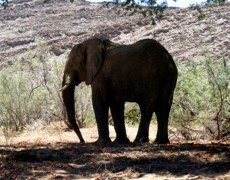 Desert elephant are known to be much more aggressive than elephants in the Etosha National park and should be approached carefully. Drive slowly, keep your car idling and never block their pathway. Please do not leave your vehicle and approach them to take photos, its extremely dangerous. Elephants will show their irritation by flapping their ears – drive your vehicle away from it calmly to open up its pathway. Always treat them with respect! The Brandberg is at 2,574m the highest mountain in Namibia. It is a huge mass of weather resistant granite created by volcanic action that became exposed by the erosion of the surrounding laves with time. 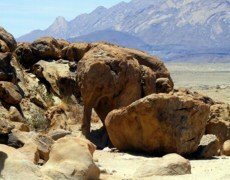 This granite elephant rock can be found near the Brandberg. The Brandberg White lady Lodge is the ideal place to spend the night before you embark on the next part of the route around the mountain back to the D2342 towards the C35 and back to Uis or Henties Bay. This stone scorpion can be seen next to the D2342, shortly before it joins the C35 and was created by the old South African Army during the pre-independence years.